I always pictured Joly with paler hair but Ben has the right face. I think Hugh Skinner was perfect in the role though. But rewatching + tumblr giffing his every facial expression made me reconsider very quickly. 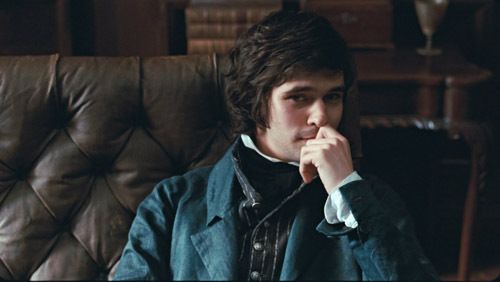 And yes, until I saw pics of Ben in Bright Star, I thought of him with lighter hair too. Ah, that's what dye and wigs are for, right? The tumblr stuff is epic. Especially that clip of him on the final barricade with a comment like "Am I the only one who's realised that we are all dead?" It was one in the same series that made me fall in love with him. "What's wrong today?" (Please say it's not contagious)"
Acaila wrote: It was one in the same series that made me fall in love with him. "What's wrong today?" (Please say it's not contagious)"
That is genius!! Ok, Joly needs to be in the next chapter of my fanfiction. Joly and bananas. Acaila wrote: What are you writing? I haven't worked on it in a while but it's a fic based around changing a few events in the story and therefore changing what happens later on. I've an OC that I've been trying to keep from Mary-Sue land. Marius needs to get killed on the barricade somehow and I can't work out how it's going to happen. It's complicated. It seemed so simple originally. Hahahaha, don't they always! I am so desperately wanting to get my first chapter done tonight and failing miserably because I feel like I need to stick closer to Hugo than I'm doing And I've ended up reading heaps of the Brick again for research. Not to mention research on Napoleon! Acaila wrote: Hahahaha, don't they always! I am so desperately wanting to get my first chapter done tonight and failing miserably because I feel like I need to stick closer to Hugo than I'm doing And I've ended up reading heaps of the Brick again for research. Not to mention research on Napoleon! Mine got complicated when I realised that the timeline I had in my head didn't match the original timeline in the book. So I have to rethink the order of events, and when you've already messed with the events, that's hard. I'm also trying to ship Enjolras with the aforementioned OC (not at the moment, but later in the story) and that is just about the hardest thing to write. Dan's hair is dark. They lightened it for Downton. So weird the first couple episodes to see him blond, but now it's to the point I think he looks a little weird in all pictures, regardless of hair colour, because I feel like none of them look natural anymore. He was blonde when he played Arthur in a version of dracula as well. I think he suits the blond better.